I received the above press release on Thursday 18th March, the morning after the Shank premiere was held at the Ritzy Cinema, Brixton. 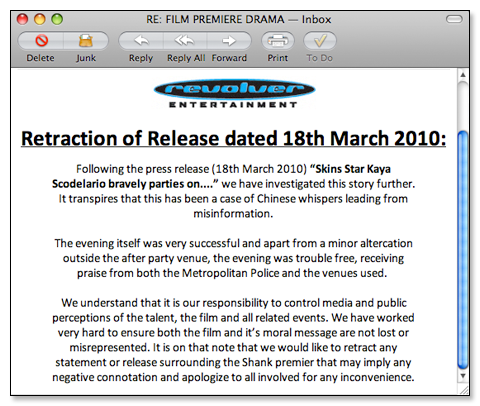 It details an incident that supposedly occurred at the premiere’s after party during which Ashley Thomas (a.k.a. Bashy), one of the film’s stars, was threatened at gunpoint by a group of armed men. The Headline (above) desperately clutches at straws to try and focus the article on the more marketable name of Kaya Scodelario, rather than the relatively unknown Bashy, despite the fact that she was entirely uninvolved in the incident. Describing her ability to party as ‘brave’, seemingly without irony, is tactless even by press release standards. The Only Quote in the entire release is attributed to ‘a guest at the event who witnessed the incident’. In other words, a Revolver employee who doesn’t want their name cited because they just heard about it from a mate.